I have been waiting for this moment. Those tomatoes that will colour have turned orange or red, and I can now see which are the green ones that won’t. 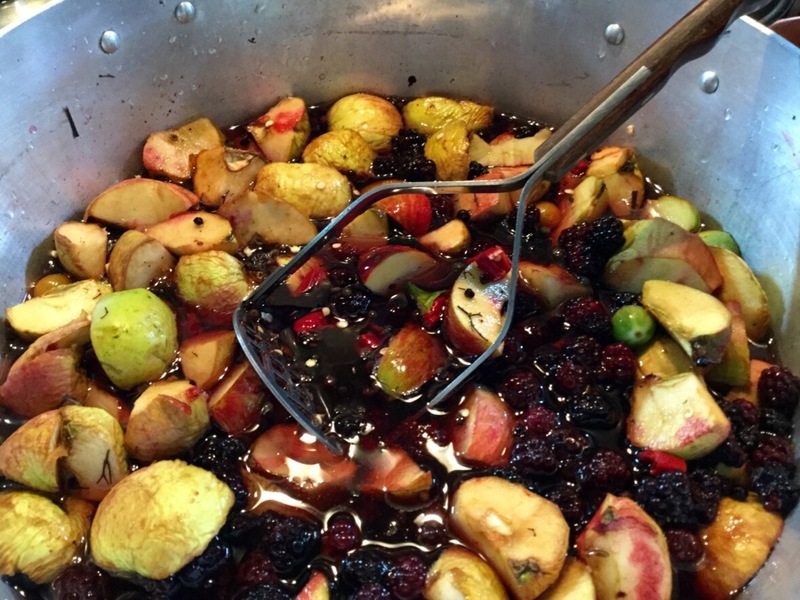 It’s time to make my spicy harvest jelly! 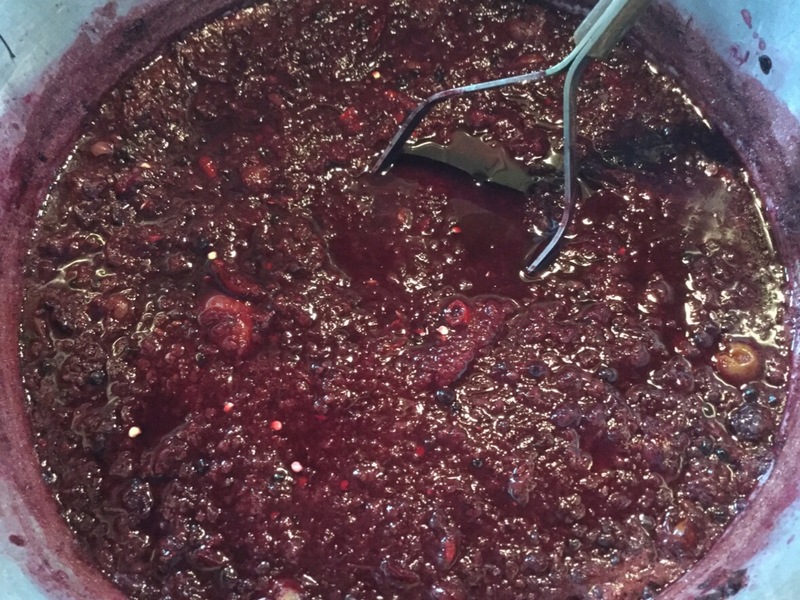 We have been collecting fruits for this jelly through the autumn , and the freezer is full with elderberries, rose hips and blackberries. 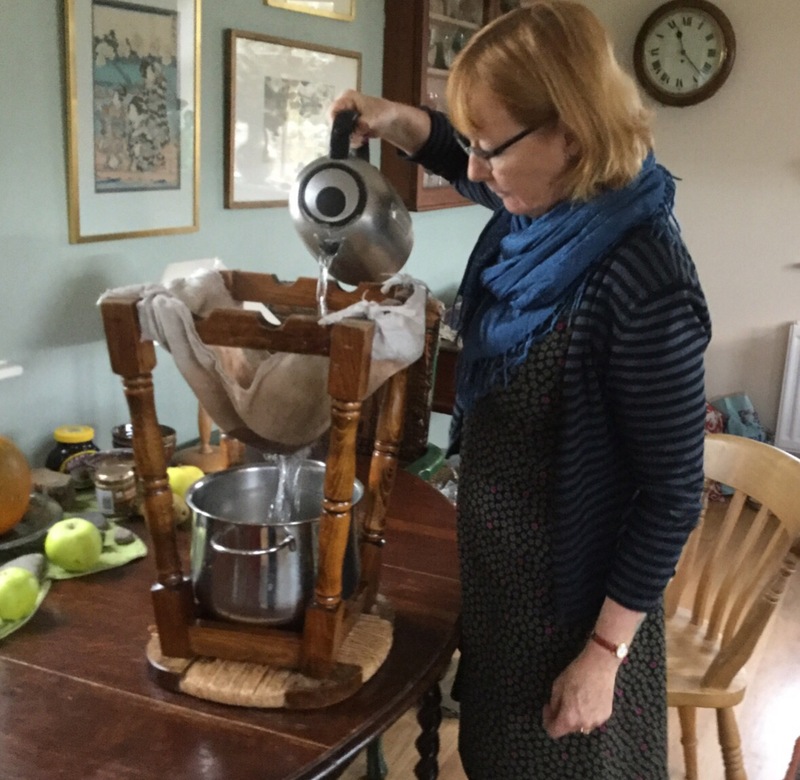 Surfaces in the kitchen are crowded with apples collected from friendly gardens – and the odd scrumping trip. Stephen’s chillis are harvested. We have been waiting for the green tomatoes. Out come the frozen berries and onto the scales they go … The green tomatoes go on the scales too … As do the chopped apples … The chillis are on the chopping board … And then they all go into the preserving pan together with some additional spices (for recipe see end of blogpost) and the mix is generously covered with water. This rich mix is simmered for about an hour and a half, and the fruits are broken up with my potato masher. 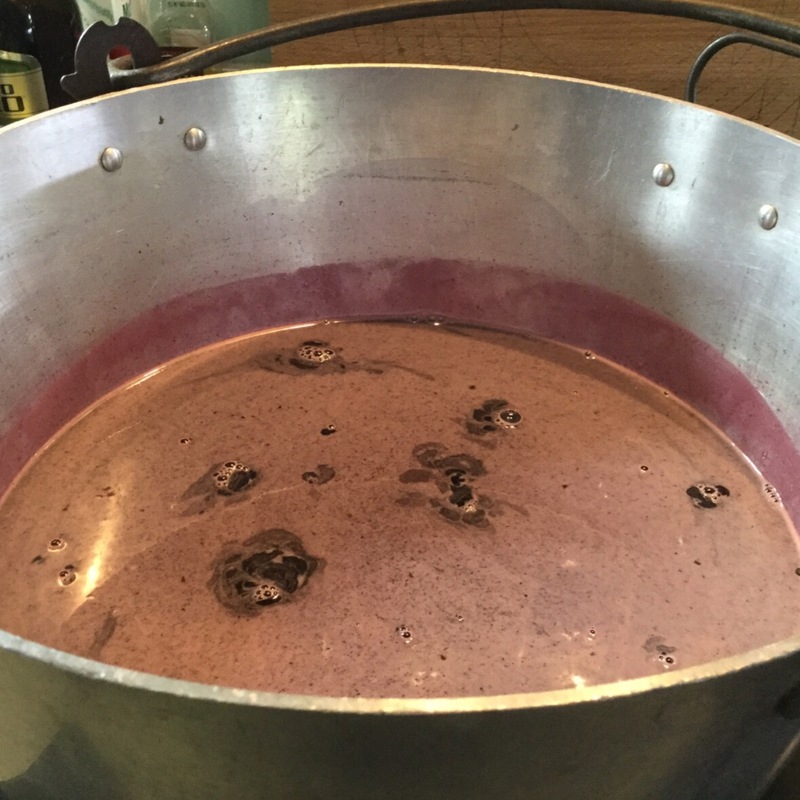 It now looks a real witchy brew, doesn’t it?! I can assure you that it smells fantastic – indeed, the whole house does. 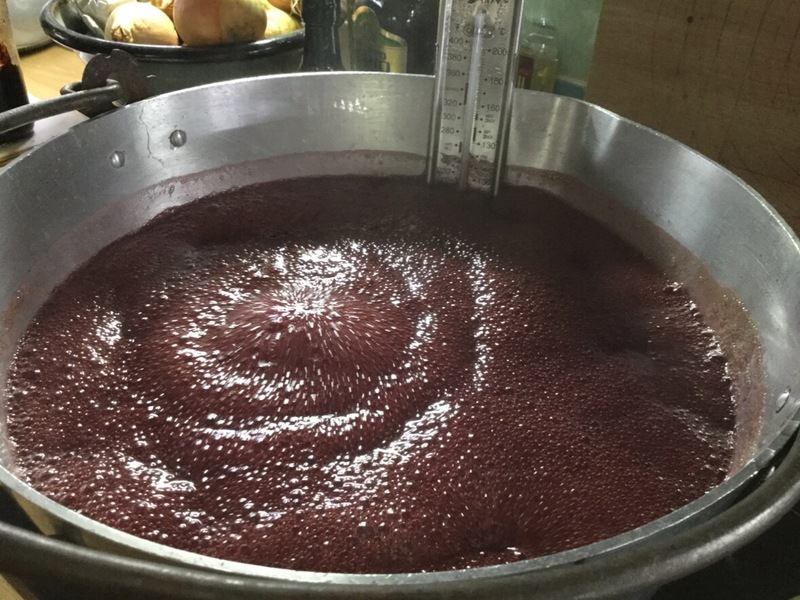 The brewed fruit “rests” overnight so that the flavours can work in together. Next morning we tasted it, decided it was very promising – and most importantly of all that the chilli temperature was just right. This is obviously a very personal matter – I wanted an interesting, warming tang, not a vindaloo blast. Well, I’ve never missed those chunks of crabapple. 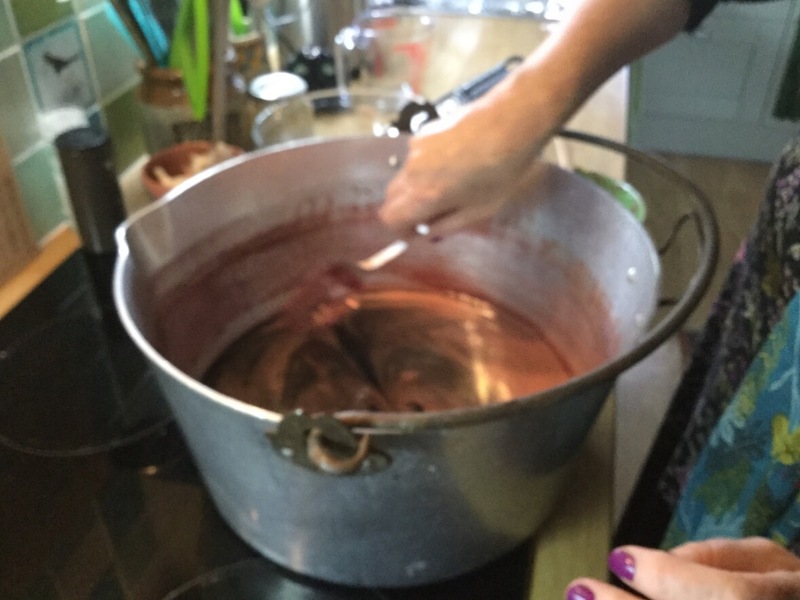 In addition, I’ve made my jelly very warm and spicy with a range of ingredients which give this jelly a very distinctive flavour. This produced 4 pints of rich sieved liquid to which I added 4 lbs of granulated sugar. It is so very pleasurable to look at the finished product. Generations of cooks must have shared this warm glow of satisfaction. Fruits of garden and field have been transformed into food to put away and sustain family and friends over the winter months. Not really like that for modern times, but my comfortable glow is because I now have some Christmas presents sorted! And – aah the wonders of Instagram!! The recipe has travelled and here is the Niçoise version, courtesy of @isaduranton! Am I the first to get in there and leave a comment this time? 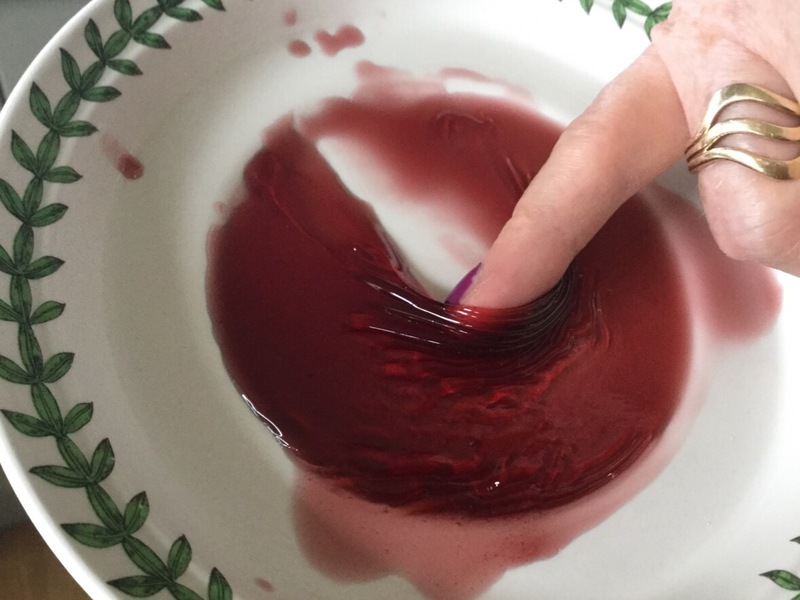 You know how much I love your harvest jelly and it was lovely to follow the making with you. 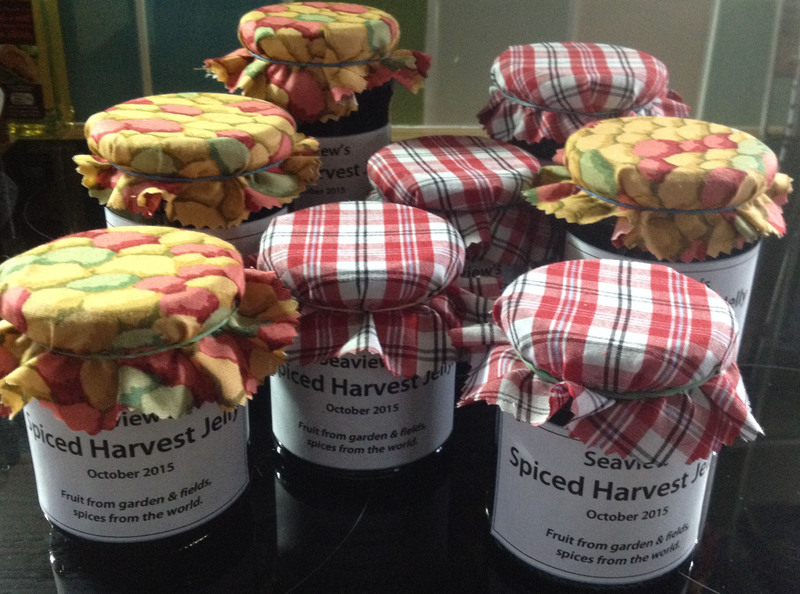 But I must say I was also inspired by the possibility of JAM which I actually prefer, texture and all! Might try it next year with my crabs. 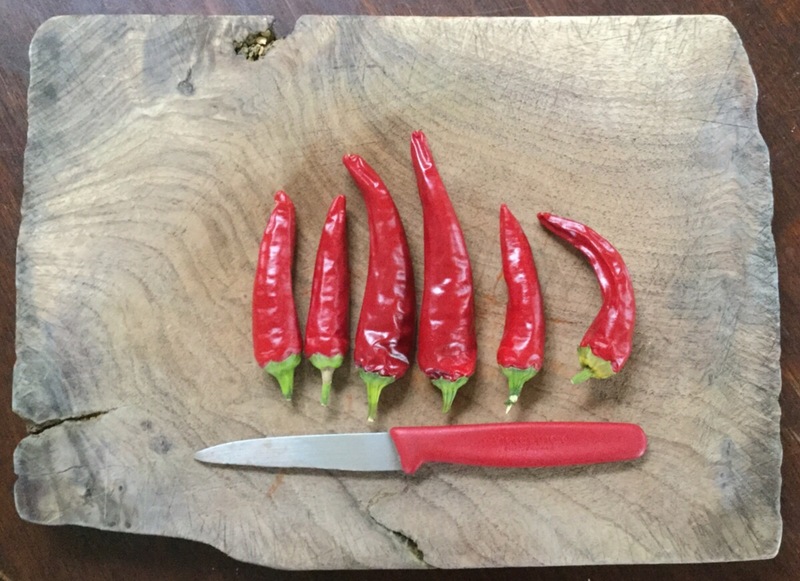 Specially liked the chillis with matching knife. Hello first commentator! 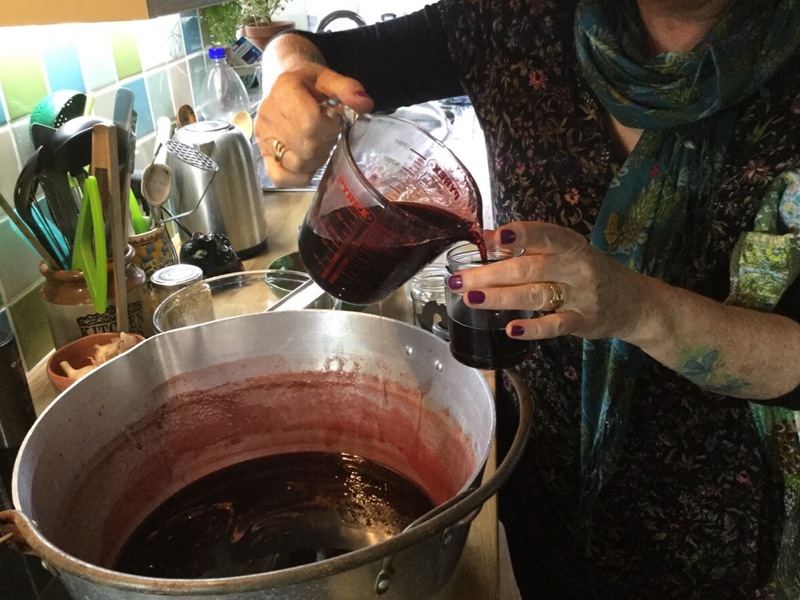 I think you’d love the Mabey’s book, Polly – and how nice to follow their chunky jam recipe with your crab apples! Better not put rose hips in then as they are whiskery, great for flavour and vitamin C but not comfortable to eat. What a wonderful tale. I love the long process of harvest you describe. So am I right that everything barr the sugar has been grown or gathered by you guys? A slow, glorious process! I hadn’t thought of it being slow cooking until you and Susan mentioned it, but I suppose it is! 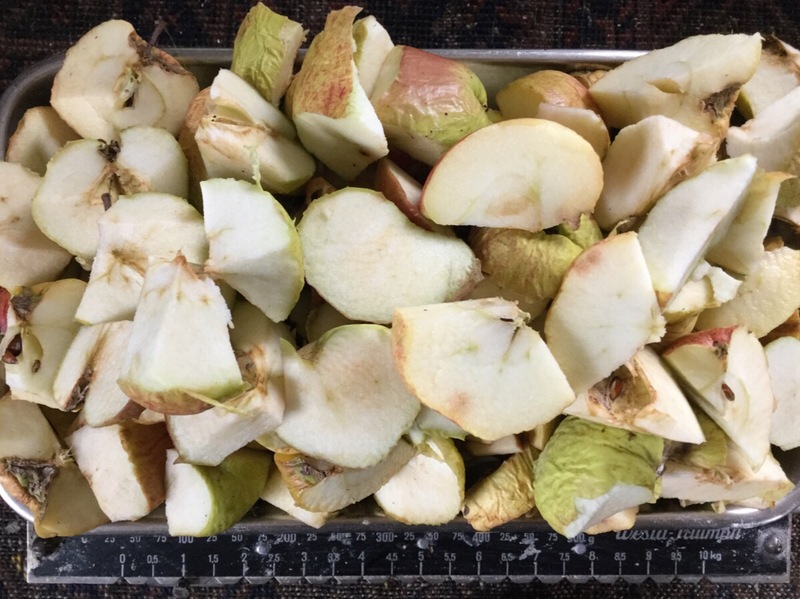 As to the contents – well, yes, almost everything came from our locality – bar the spices and the sugar too. We could try growing sugar beet next year – now that would be a challenge! Amazing combination! I tried finding it in my British (tome) Cookery Book just out of curiosity and all I found was Hedge Hog Soup… and not even using a Hedge Hog, phew, but almonds and ham and Goddess knows what else 🙂 But I too love the process of this ‘slow’ food. Am trying to imagine the taste…….thanks. I would have never thought to combine tomatoes with fruit! I am going to have to try that. 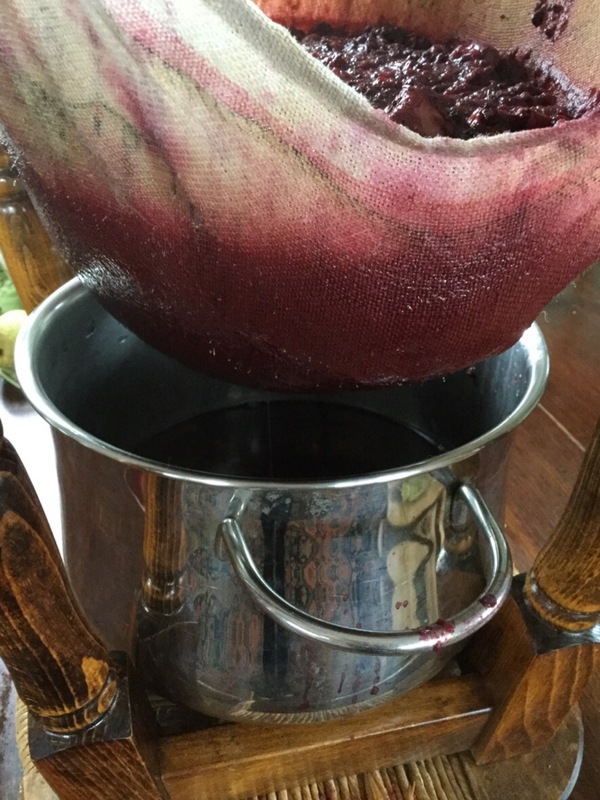 I make jelly from our wild grapes and those are my Christmas gifts too! But I would love to try this and then I could give a lovely gourmet assortment! 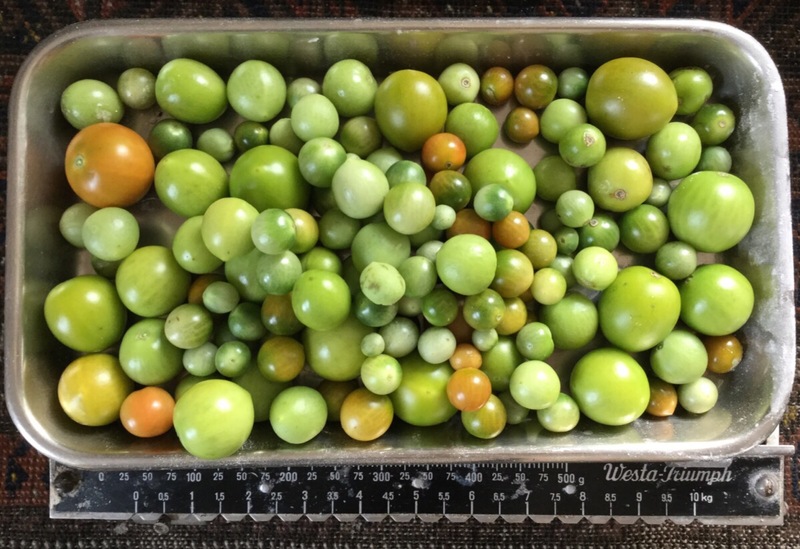 Well – I think tomatos are actually classified as fruit, which is probably what led me to add them (in desperation ….what can I do different with green tomatos this year!). They really work very well in the mix. I’d love to find some wild grapes to add to my mix next year – those lucky people on your Christmas gift list! 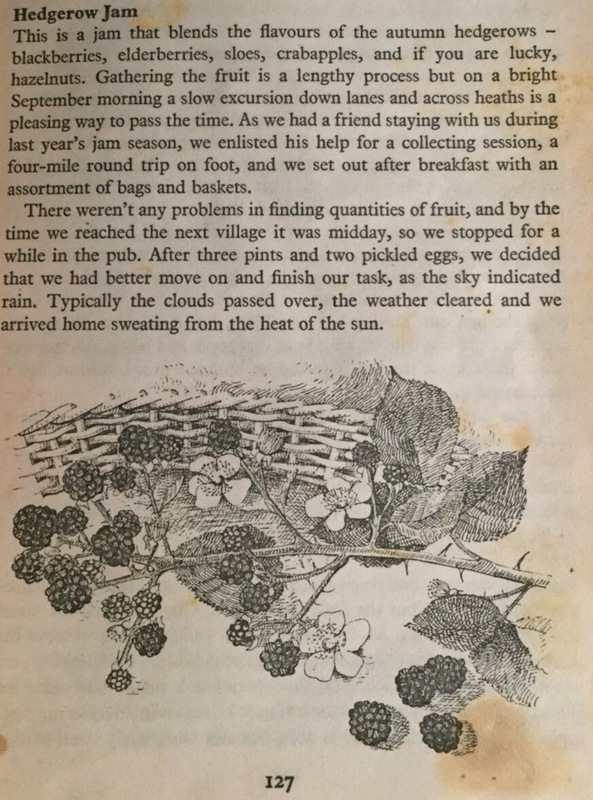 I make a hedgerow jelly or jam most years but have never added green tomatoes or chillies. Definitely one to try next year as it sounds much more interesting than my recipe. 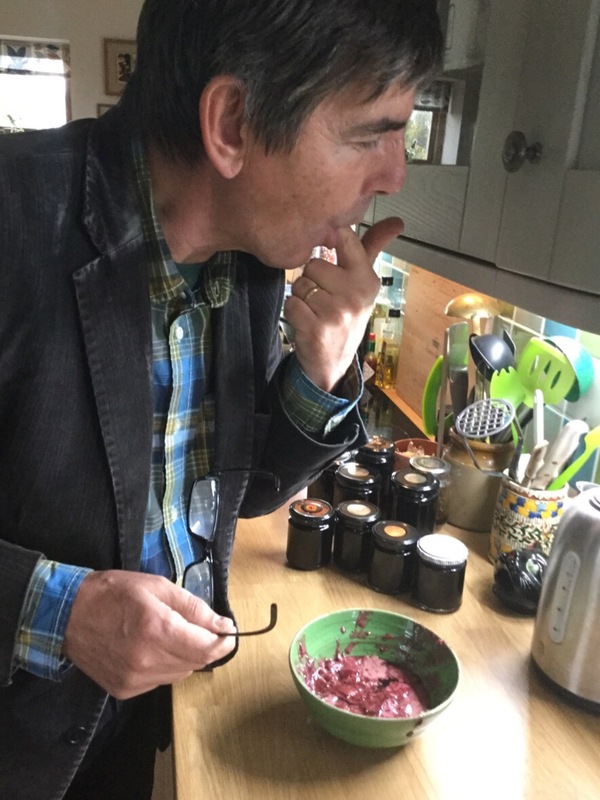 I think any hedgerow jelly or jam is exciting because you never quite know what you’ll find to put in it – I’d have been very tempted to add some of your surplus pumpkin to my harvest jelly – chunks of that would be really tasty in a jam! My chilli plants are just 10 cm high but already I am planning on using them in chutneys next Autumn. 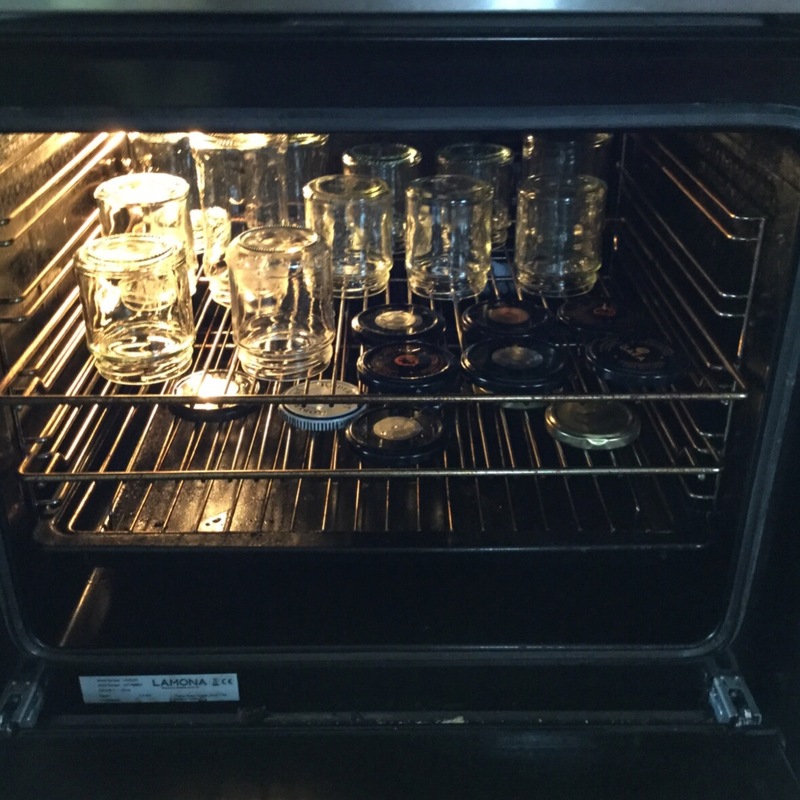 Will keep your recipe in mind…..! So exciting thinking of your spring coming to summer as we dip down into winter – all those plans for plantings and growth! Hope those chillis grow well! !